Two years ago my brother showed me a compost tea brewer. I asked him how it worked; he told me that it turns compost into foliar. My father got so excited, he bought one. I was not convinced with my brother’s explanation so I made my own research. Then several days after my father bought the brewer, there was chaos. Everyone within 5 meter distance from the brewer could smell rotten egg or even worse. There was something wrong with this brewer. I can’t believe the commercially sold brewer could win an award with so many faults. I decided to intensify my research and eventually make my own brewer. 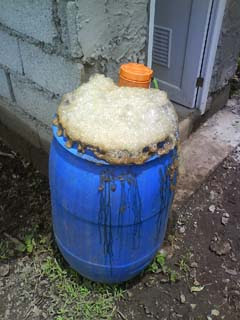 The first compost tea brewer I made was so big for our farm. 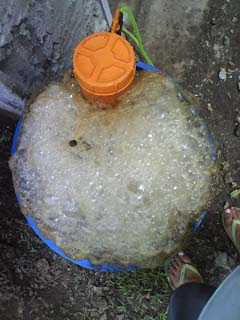 It was so big; it can brew up to 100 gallons of compost tea. I made a smaller one, good for 5 to 30 gallons. The brewer was intended for our farm, when visitors ask where we get our organic foliar fertilizer, we just point them to the brewer. Since then, people started asking us to make one for them. I named it the R.E.A.C.T.O.R. which stands for Reliable, Effective, Aerated Compost Tea Of Raymond. We now custom build compost tea brewers, from the small 5 gallon brewers to the biggest 250 gallon models. I also teach the principles of compost tea brewing so everyone can make their own brewers. It is very important to understand how it works before building one, rather than building one and discovering it doesn’t work. Our brewer works, we have the farm to prove it! How much does your brewer costs (average size)? Hi. Could you please post the process of making compost tea. What's the difference between vermi tea and the latter. Thanks. hello scube frog, vermi tea is a kind of compost tea. some called it vermi tea because vermi compost was used. you can actually use any kind of compost but it is best to use vermi cast - a more purer form of vermi compost. mr. luis gabriel, the brewer we use costs about 3500 pesos, with compressor. good for up to 100 liters of tea per batch. Thanks Raymond & Mariel. I'm actually looking forward to your blog updates. Consider me your number one (organic) fan. Keep up the good work and more power to your organic efforts. Can you give me some instructional detail on how to create my own Tea Brewer? I have researched on the internet simple procedures creating a tea brewer, but I also it be would like to know how setup your own. Would it be possible for you to send it to my email: aylab_tungaw@yahoo.com. Thanks so much! Currently I have 15 multiplier bins of African Night Crawler in Sorsogon City. I can harvest 500 kilos of vermicast per month. It will be great if I can brew some of those vermicasts. May I request for vermitea brewer 101 / techniques in brewing vermitea! WOW Gilbert! you have lots of worms. I bet you have lots of organic matter to feed them. Will the compost tea on an aeroponic system work? Is the nutrients enough for the plant?